David Gardner stands on the dock next to the Kettenburg 38, now renamed 38 Special that he restored over the 3 1/2 years. He returned her to the water in late June. Capt. Nicole Sours Larson photo. My friends know I’m a sucker for good boating yarns. 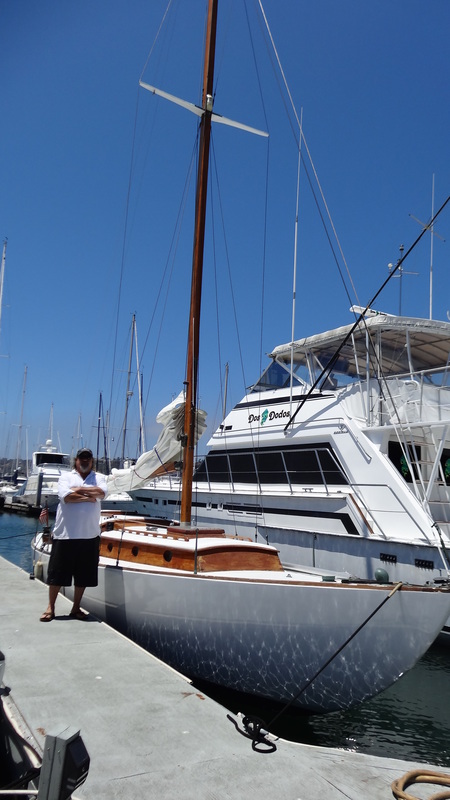 Recently my journalism bud, award-winning videographer Robert Gardner, shared a story about his son’s acquisition of a classic San Diego sailboat. His son’s story turned out far more interesting than the tantalizing snippet. David Gardner stands on the dock next to the Kettenburg 38, now renamed 38 Special that he restored over the 3 1/2 years. He returned her to the water in late June.Capt. Nicole Sours Larson photo. 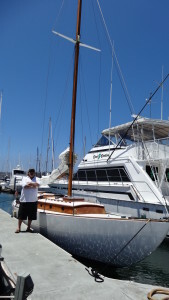 David Gardner, owner of Dynamic Marine Machining on Cañon Street near Shelter Island, was trolling the internet, looking for a K-38, the sailing yacht built by Kettenburg Boat Works in San Diego in the 1940s and ’50s, more out of curiosity than any immediate purchasing intent. He wanted to try sailing the legendary model. Proud owner of a 1948 Kettenburg PC, a 32-foot sailboat he races, Gardner had caught the sailing bug as a kid and loves old wooden boats. He had already worked on several restoration projects. Much to his surprise, his internet search struck pay dirt, identifying a 1954 Kettenburg 38, hull number 28, on a charity’s vehicle donation site, advertised for $2,500. He decided to investigate. Located in Marina del Rey, the boat was at a marina that wanted it gone, preferably yesterday, because it was uninsured and uninsurable. The previous owner bought it without understanding the depths of its problems and couldn’t afford repairs, opting instead to donate it. After determining the boat was sufficiently seaworthy to sail home to San Diego, Gardner, a skilled machinist, plunked down his money, understanding he’d have to draw on all his skills and experience and the expertise of friends and colleagues to restore his K-38. He was encouraged that she made it back to Shelter Island, following a stop in Catalina, with relatively minor blips, despite “leaking a river down the bilge.” Before hauling her out for her major refit at Koehler Kraft he even raced her a few times. Gardner knew what he was getting into, but never imagined it would take so long. He performed the bulk of the labor himself, working evenings and weekends, even giving up performing as a bassist with his longtime Irish punk rock band, the Downs Family. It took 3 ½ years before he could return her to the water. Gardner finally launched his K-38, now renamed 38 Special, in late June, after spending tens of thousands of dollars and thousands of hours of sweat equity. He’s grateful for extraordinary help from dedicated friends including Robby Hikethier, Ed McCoy, Diane Keefer and his son Shawn. CF Koehler, he explained, generously taught him how to laminate Purple Heart, which he used to replace the frames. 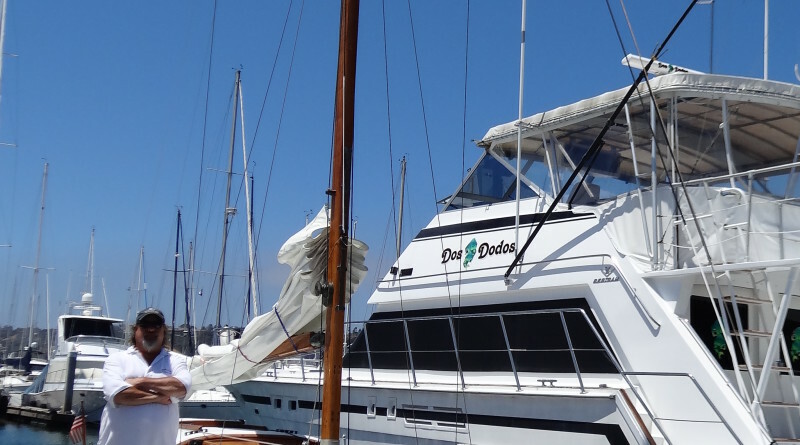 “We stripped the whole boat down and relaminated every frame and replaced all the floor timbers with Angelique, secured with monel floorbolts, and all the keelbolts with silicon bronze. I did all the metalwork. Everything that could be modified for improved performance and functionality I modified,” Gardner explained. He reused the standing rigging but changed the running rigging. In the course of his restoration Gardner identified the core design failure of these legendary sailboats: black iron rot from galvanized steel bolts that rusted out and destroyed all the surrounding wood. With his labor of love nearing completion Gardner describes the allure of the Kettenburg 38’s design. “They’re beautiful, they have great lines and they’re fast,” he said. Thanks to Gardner’s dedication, this classic sailboat is now stronger than ever and will live again to sail for many decades. What a beautiful mast. Can we see the rest of the boat? Just click on the photo in the text and a larger version of the photo will open.